← Hos Your But Crack? The Sun’ll Come Out… Tomorrow? But few of us ever have the foresight to post a sign on our bedroom door alerting others to the fact it’s the worst day of life. By far. And including a hand-drawn emoticon to further drive home the point and alert potential non-readers to the fact? Next-level stuff, for sure. Thanks to Anji for sharing her son’s sun’s status update. If he’d drawn a “Like” box, we’d have checked it for sure. 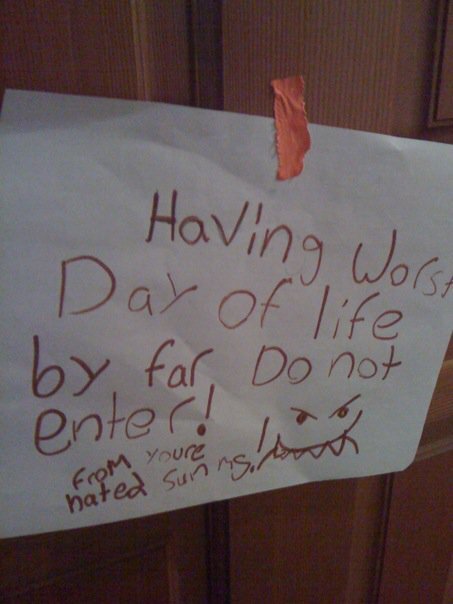 Posted on April 24, 2012, in Miscellaneous, Misspelled, Notes and tagged children writing, funny kids writing, funny writing, Humor, kid writing, notes on bedroom doors. Bookmark the permalink. 3 Comments.